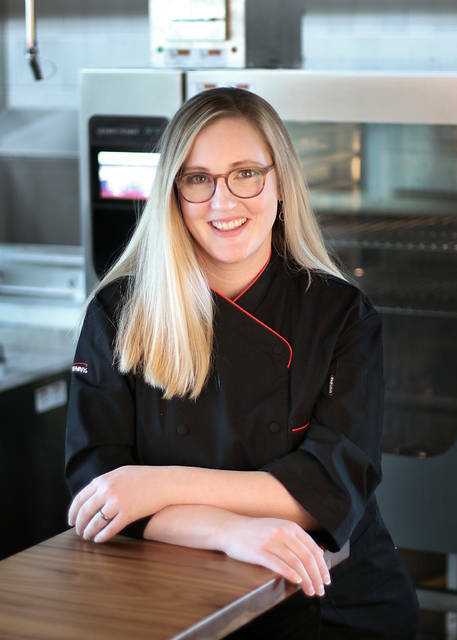 EATON — Henny Penny has hired Nikki Heaton, adding a new corporate chef and member to the company’s brand team. In this role, she is responsible for creating memorable moments and culinary experiences for the company’s customer and partner visits, technical training visits and various trainings for distributor networks out of Henny Penny’s Eaton headquarters. Heaton comes to Henny Penny from the Michelin North America headquarters in Greenville, South Carolina, where she prepared meals for employees and customers including three-Michelin-starred chef Curtis Duffy and actor Keanu Reeves. Heaton’s resume also includes work at BMW, Furman University and Amelia Island Plantation. Under her new employer, Heaton plans to deliver quality food experiences that elevate the Henny Penny brand. “My goal is for every customer at Henny Penny to get a taste of the quality we have to offer,” said Heaton. Heaton is a native of Brookville, Ohio and is a graduate of Johnson and Wales University with degrees in Food Service Management (B.S) and Culinary Arts (A.S.). She attributes finding her calling to cuisine to growing up and watching her father, a fireman, cook for his co-workers in the firehouse.